JOGS International Exhibits, LLC. provides a visa invitation letter for accepted exhibitors who are up-to-date with payments on their booth. 1. 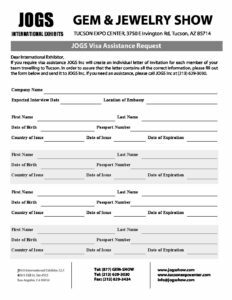 Fill out the JOGS visa assistance request and mail, e-mail or fax it to the JOGS Show office. Please fill out for each person you are requesting a Visa Invitation for. 2. Make an appointment at the U.S. Embassy. 3. Choose a mail carrier: FedEx, UPS or USPS, FedEx and USPS are preferable choices. Provide detailed delivery address and pre-pay the shipping fees to JOGS International Exhibits, LLC (shipping fees vary based on the carrier rates). If you are already registered with any of the above mentioned carriers, you may provide us your account number to pay for the shipping directly using your account. 4. After the payment is received the packet consisting a letter of invitation to the annual JOGS Tucson Gem and Jewelry Show and the invoice confirming your booth space at the show will be sent to the provided address. If you do not require a visa invitation to be mailed to you, you can request to receive a copy of your invitation letter by email. 5. Take the invitation package to the interview and present it to the visa officer as a proof of your purpose of visiting the United States. 6. JOGS International Exhibits, LLC charges a $40 processing fee per invitation issued. 1. Prepare all necessary documents for your interview. Your packet should consist of passport, birth certificate, DS-160 confirmation page, proof of operating a valid business entity, income tax return, bank statements, marriage certificate (if applicable), visa invitation. If you have commercial and residential property registered under your name, stocks, bonds and other kinds of assets you might want to bring the proof of ownership of the above mentioned properties as well. 2. Arrive early, wear formal clothes as for the formal business meetings. If possible, men should wear a tie. 3. Make sure to show strong ties to your country and your intention to come back after the successful completion of your business trip.